Bumthang is located in north-central Bhutan, and is comprised of 4 valleys: Chumey, Choekhor, Tang and Ura. Their altitudes vary from 2,600 metres (8,530 feet) to 4,000 metres (13,125 feet). Jakar in Choekor valley is main center of the Bumthang district. Bumthang, with Jakar Dzong in the background. More than 66% of the district is covered with forests. Agriculture is practiced in the Choekhor and Chumey valleys while yak and sheep breeding was the main occupation in Tang and Ura valleys. Potatoes were recently introduced in these two valleys and are now an important source of income although the main crops still remain buckwheat (sweet and bitter), barley and wheat. The valleys of Bumthang are generally wide and open with relatively gentle slopes, thus creating a unique feeling of spaciousness that may not be found in any other part of the country with the exception of the Phobjika valley in the Black Mountains. Bumthang is inter-spaced with many rural hamlets and is suited to moderate hiking. Until the 1980s, Bumthang was a fairly poor and isolated region depiste its status as the main residence of the first and the second Kings. However, since the construction of the east-west road in the late 1970s, the area has undergone significant economic development. 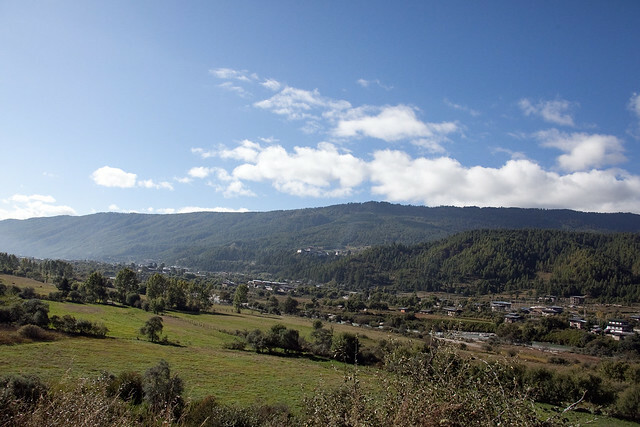 Tourism and agricultural projects, in particular, have helped Bumthang attain a good level of prosperity, which is apparent in the number and quality of houses built by the population in the last fifteen years and the amount of shops now seen in the district centre, Jakar (also spelt Byakar). The “star products” of Bumthang include white beer (Red Panda), honey, fruit schnapps, cheese and woollen textiles. Bumthang means ‘the plain shaped like a bumpa’, a bumpa being an oblong-shaped holy water vase. The religious connotation of the name aptly applies to the sacred character of the region. It would be difficult to find so many important temples and monasteries in such a small area anywhere else in Bhutan. According to tradition, Bumthang was one of the valleys where theTibetan King, Songtsen Gampo (7th c.), chose to erect the temple, Jampa Lhakhang, one of 108 Buddhist temples that he is said to have built all over the Himalayan world. However the official conversion of the Bumthang region to Buddhism took place a little later in 8th century, when Guru Rinpoche (Padmasambhava) restored the health of the king of Bumthang at the time, known as Sendarkha. During his stay in Bumthang, Guru Rinpoche is believed to have left several traces of his visit such as imprints in rocks, and these vestiges are still highly revered to this day. Bumthang provided a temporary home to famous Tibetan saints of the Nyingmapa schools Longchen Rabjam (1308-63) and Dorje Lingpa (1346-405). However, the most famous of all the religious men is Pema Lingpa (1450-1521). Born in the Tang valley of Bumthang, Pema Lingpa built several temples in Bumthang such as Kunzangdra and Tamshing and laid the foundation of a new religious lineage. His descendants subsequently moved to the central and eastern parts of Bhutan and contributed to the expansion of the Nyingmapa school. Dorje Lingpa and Pema Lingpa are also two of the most important tertons, literally meaning “revealers of religious treasures” hidden by Guru Rinpoche. Several lamas of the Drukpa Kagyupa school including Lorepa (1187-1250), and Tenpey Nima ((567-1619), the father of the future unifier of Bhutan, as well as lamas of the Karma Kagyupa school also visited Bumthang. From the 9th to the 17th centuries, the Bumthang valleys were ruled by noble families called Choeje or Dung who were descended from prestigious lineages. After remaining more or less independent for centuries, Bumthang was subsequently conquered by the Drukpas who were unifying Bhutan under their religious and political influence during the middle of the 17th century. Jakar Dzong became the administrative and religious centre of Bumthang with a local administrator called dzongpon governing the area. In the middle of 19th century, Jigme Namgyal (1825-1881) who was the de-facto ruler of Bhutan and the governor of Trongsa (Trongsa Penlop) decided to settle himself in Bumthang and built the Wangduecholing Palace in 1857. His son Ugyen Wangchuck, born in Bumthang, became the first king of Bhutan. From the time of Jigme Namgyal until the death of the 2nd King in 1952, Bumthang was the seat of the rulers of Bhutan.